As we left Mumbai at 5:00am this morning, I was trying to think about what to write for the first blog entry for this trip. I thought maybe I would write about the cultural experiences the team had, about the people we met, about the traffic, or all of the great food, but I couldn’t figure out where to start. As I got on the plane to start the trek to Kalimpong, I started praying that God would show me where to start. It wasn’t until we made it to Kalimpong that He showed me what I should write about: the overwhelming fellowship we have with our brothers and sisters in Christ here in India. When pastors Amber & Sunil and their wives came to pick us up at the airport, it was a little crazy. 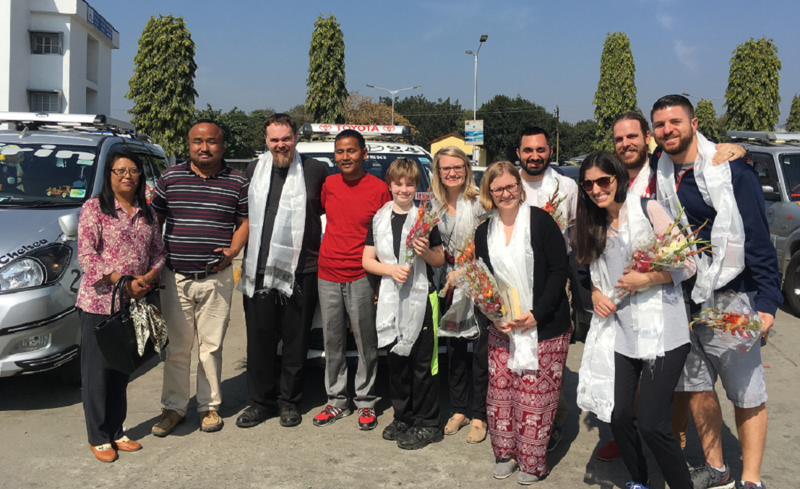 We were trying to maneuver 12 people through a busy airport parking lot and either meet or reconnect with the two leaders of Asia’s Hope in Kalimpong. They were more than gracious; they gave each of the team members flowers and scarves, and they took such great care of us. 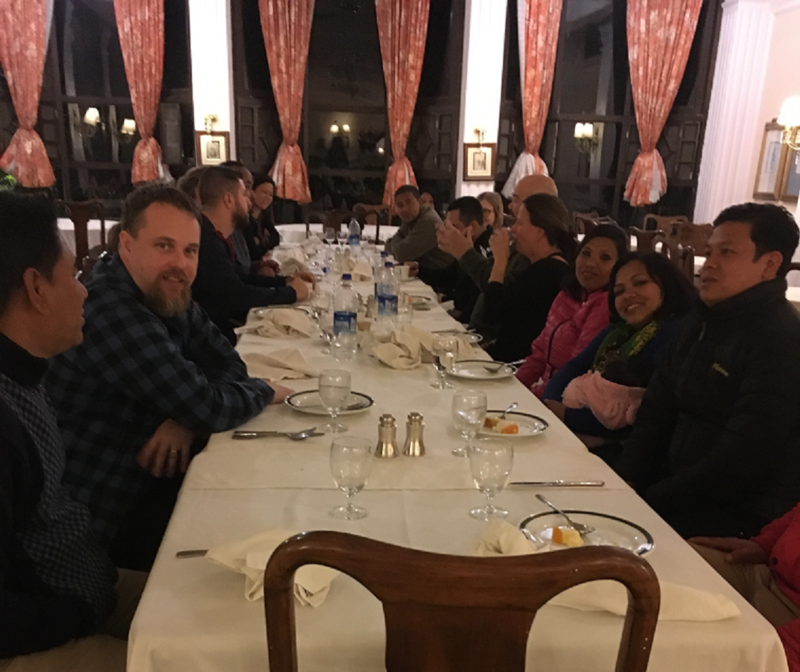 We all went to each lunch together in Siliguri before making the two hour winding drive up the Himalayan foothills to our final destination: the Elgin Hotel in Kalimpong. Conversations between the team and Amber and Sunil, while friendly and warm, were also a little awkward, as everyone was trying to acquainted (or reacquainted) with our Kalimpong friends over lunch. Once we got to the Elgin, though, we were able to really spend some time with Pastors Amber and Sunil and their wives. We had tea, coffee, and biscuits, met other friends of Asia’s Hope, discussed our schedule for the rest of our time in India, and asked how we could bless the leaders, parents, and kids while here. Gradually, this conversation led to Pastor Amber mentioning the need for host parents for Kalimpong Home 6. From there, this started a God-given dialogue between everyone and eventually led to an impromptu prayer for God’s intervention, praying that God would lay the desire and passion to care for these children on a couple’s heart and that God would specifically prepare them for this purpose. Corporate prayer has this amazing side effect of fellowship with other believers: it was bonding and empowering to pray for a common purpose with the people who serve God through Asia’s Hope. It was one of those moments where you just feel God’s presence in a place. After that, the house parents from Kalimpong Houses 4 & 5 came to meet us at the Elgin for dinner. After initial greetings, we all made our way into the beautiful dining hall. As we walked in, the waiters started putting tables together. We watched as they put together four tables and then realized there weren’t enough seats for us all. I know it was a small thing, but watching the waiters add two more tables to make room for everyone just made me stand in awe for a moment. It’s like God was saying, “This is what it’s like at my table! A table that has food for everyone and there’s always room for more. Come, eat, drink, and be with Me and with each other.” How amazing! I was overwhelmed as I sat down between Pastor Sunil and Jordan and looked down the table at all the happy faces conversing with friends. I was so thankful that God was faithful and had shown me what to write about: a picture of what it looks like to be adopted as children of God, united in Christ. It was a little glimpse of sitting down at the Father’s table, and it makes me excited for the day when this becomes our reality: a family full of redeemed saints, living together and loving an amazing God whose heart is for us. As I wrap us writing and get ready for bed, I am reminded of how grateful I am to have a family in Christ. I hope, as you go throughout your day, week, season, and life, that God reveals Himself to you through your community in a way that makes you stand awe of the love the Father has for you and for others.